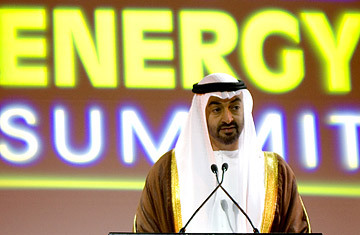 General Sheikh Mohammad bin Zayed Al Nahyan, crown prince of Abu Dhabi, speaks at the World Future Energy Summit in Abu Dhabi, United Arab Emirates, on Monday, Jan. 21, 2008. If you filled your tank with gasoline today, or warmed your home with natural gas, there's a decent chance you sent some money to Abu Dhabi. The capital of the United Arab Emirates (UAE) is blessed with fossil fuels, including the fourth-biggest reserves of oil in the world. Selling that petroleum at record prices has helped Abu Dhabi achieve the highest per-capita GDP in the world  wealth that's visible in every luxury hotel rising from the desert or spotless Mercedes prowling the streets. All those fossil fuels also mean that Abu Dhabi citizens have among the biggest carbon footprints in the world, and the emirate's exports are a big, if indirect, contribution to global climate change. But if the idea of an Arab oil power like Abu Dhabi supporting fossil fuel alternatives sounds a bit like a heroin dealer trying to sell methadone, think again. Virtually alone among its Persian Gulf neighbors, Abu Dhabi has embarked on a serious program in alternative energy research, backed with oil money. In 2006 it launched the Masdar Initiative (the name means "source" in Arabic), a multi-pronged scheme that includes a collaborative research institute with the Massachusetts Institute of Technology, support for solar and other kinds of green power within the city itself and a clean energy investment fund worth $250 million. The idea behind Masdar  which organized the Future Energy Summit  is a radical one: prepare Abu Dhabi and the UAE to move beyond fossil fuels. "The UAE wants to be more than just an oil-producing country," says Marc Stuart, the co-founder of the carbon-trading firm EcoSecurities. That will take money, but thanks to record oil prices, money is one thing Abu Dhabi does not lack. At the summit's opening conference, Abu Dhabi's Crown Prince Sheikh Mohammad bin Zayed Al Nahaya announced that the government would channel an additional $15 billion to the Masdar Initiative. Although the money comes with no time frame, and officials wouldn't say exactly where the funding will go, Masdar also announced that it would join Rio Tinto and British Petroleum to build the world's first hydrogen power plant, a 500-megawatt operation that would cost at least $2 billion. These are bold plans  especially for a city that had little green experience until recently  but for Abu Dhabi, investing in alternative power is a way to remain a world energy center in the event that concerns over climate change cut into the demand for fossil fuels. "We have a long tradition as a global energy leader and we have the financial resources to develop new fields of energy," said Sultan Ahmed Al Jaber, Masdar's CEO. "Leadership entails responsibility." Even more ambitious is Masdar's plan to build a completely new city in the desert that will produce no carbon and no net waste, chiefly powered by solar energy. Designed by the British architect Lord Norman Foster, a veteran in sustainability, Masdar City will eventually house 50,000 residents and more than 1,000 businesses, most of them in alternative power and sustainability. Groundbreaking is set for Feb. 9. Today the space that will be Masdar City, near the international airport, is still empty sand  save for 25 different solar panels being run in an 18-month experiment to see which kind of photovoltaic technology works best in Abu Dhabi's punishing environment. (Extreme heat and dust  common in the desert  can reduce the efficiency of many solar panels.) For Gulf nations like the UAE, blessed with no shortage of sunlight, solar power could potentially be the oil of the future. "I think there is great, great potential here," says project manager Sameer Abu Zaid, as he toured the testing facility, the sound of the call to evening prayers echoing over the desert. "This is very exciting for us." Still, standing by Sameer's solar panels, Masdar City remains an imaginary place. For all the ambitious announcements and bold pledges made at the Future Energy Summit, too much is yet to come, while the climate crisis bears down on us with greater urgency every day. Walking through the summit's exhibition hall, where companies from Spain to the U.S. to Japan hawk wind turbines and eco-cars and thin-film solar, a technologically-driven optimism battles with a fear that all humankind's best ideas, on display here, aren't moving fast enough to save us. As the summit's hosts were only too eager to emphasize, when they weren't announcing a new hydrogen plant, almost every projection of energy use over the next several decades says that fossil fuels aren't going anywhere. Abu Dhabi will develop hundreds of megawatts of clean solar power, but it will export far more polluting power in oil  because the world will need it and there is nothing else feasible to replace it. "The World Future Energy Summit is nothing less than the future of the world itself," said Jonathan Porritt, founder of the UK sustainability organization Forum for the Future, one of the few speakers at the conference to call for a rapid reduction in fossil fuels. Green dreams are nice, but we need a green reality soon.